I investigated and followed this story along with Palestra through the Fall. You can get caught up quickly at this post. Months later, the three leaders of Vote Today Ohio were found guilty of voter fraud. Three staff members for Vote Today Ohio, an independent get-out-the-vote organization supporting Barack Obama, pleaded guilty in Franklin County this afternoon to voter fraud. The three came to Ohio from states where Obama was likely to win in an effort to swing Ohio’s electoral college vote toward their candidate, Judge Charles A. Schneider said. Given a year’s probation and a $1,000 fine were Daniel Hausman, 32, and Amy Little, 50, both of New York, and Yolanda Hippensteele, 30, of California. They told the court they had good intentions when they registered to vote and cast ballots the same day in early voting at Veterans Memorial. Assistant Prosecutor Brian Simms said the three later tried to rescind their registration and cancel their votes; two were successful. Franklin County Prosecutor Ron O’Brien had warned visiting campaign staff members that they shouldn’t vote here if they didn’t plan to stay after the election. Amy Little was fired as a campaign adviser to Rep. John Hall (D-NY) after it was revealed that she had voted in Ohio, despite a residence in NY and intentions to return to NY. Michael Stinziano, Director of the Franklin County Board of Elections, said he expects there may be more such outcomes since his office referred more allegations to the prosecutor. Lots more on this story here. Someone named Berthos just revived a thread from 2006 called “You might be from Porchmuth, if…” Porchmuth (how the natives say it) is really Portsmouth, Ohio, my home town. Reading through the comments, I remembered at the time trying to find a pic of the memorable-yet-tacky Blue Cloud. Couldn’t find one at the time. Well, I struck Blue Cloud gold tonight. Here is the caption from the blogger, David Reynolds, who posted this gem. 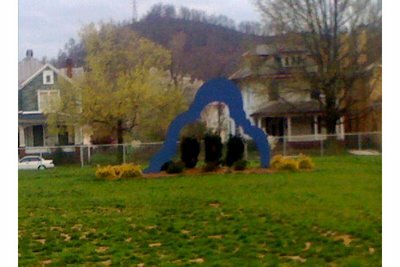 The infamous Blue Cloud modern art sculpture now resides in a fenced in yard between the new Portsmouth Elementary School playground and Kim’s house. The Blue Cloud used to be downtown in the Roy Rogers Esplanade until some woman tripped over its far left side and fell and sued the city! Tripped over a huge blue cloud in Portsmouth…. Wowsers… And sued! Well, that is much of the story. First, the Blue Cloud was simply erected in the middle of a common area in the middle of an open area downtown. People could touch it, ponder it up close, etc. But then the accident happened and a chain fence went up around it. Some were not happy with the Blue Cloud going into captivity. A group was formed called Free the Blue Cloud. Finally it was removed. At least that’s how I remember it. Now The Blue Cloud sits in a restful-yet-proud place as noted by Mr. Reynolds.